With the Los Angeles cousins of the merry pranksters at the Chicago Tribune victimized by an embarrassing hoax, does deceiving a newspaper seem as funny today as it did last week? That’s what I would ask those who branded me a dour, old fuddy-duddy for criticizing the Tribune for deceptively entering a video in a contest sponsored by the Chicago Sun-Times. Adding injury to insult, the Tribune deliberately misled the Sun-Times reporter seeking to confirm the bona fides of the purported creator of the video. The shoe was on the other foot today, when the Los Angeles Times, a corporate cousin of the Tribune, had to apologize for a false story that was based on phony FBI documents evidently fabricated by a federal prisoner, an oops discovered and brilliantly reported here by The Smoking Gun. The discredited Times story, which was based in part on the apparently phony documents, suggested that two associates of rap impresario Sean (Diddy) Combs were behind an unsolved 1994 attack in which rapper Tupac Shakur was pistol-whipped and shot several times. The story, which was vigorously denied at the time, has been topped at latimes.com with an apology, but the original is cached here on Google. To be sure, the damage caused by inducing a newspaper to erroneously accuse someone of attempted murder is far more serious than misrepresenting the source of a light-hearted video about potentially changing the name of Wrigley Field to Viagra Park. But the transgression – deliberately misleading a newspaper, and, by extension, the public – is the same in both cases. For some twisted reason, the fellow who evidently created the phony documents that duped the L.A. Times sought to implicate himself in the Tupac assault. I can’t fathom his motivations. But I would think that journalists fortunate enough to work at a newspaper like the Chicago Tribune would be committed, first and foremost, to fully, fairly and faithfully informing the public. Misleading the readers of a competing newspaper, no matter how amusing the stunt might have seemed to the pranksters, is a violation of the public trust that all respectable newspapers are supposed to serve. While it is painful to see a proud newspaper like the Los Angeles Times embarrassed by some flake, it is downright depressing to see journalists at one publication conspiring to plant false information in another. That’s not an amusing prank. It’s unethical behavior. And it’s wrong. The public trust, an increasingly scarce commodity these days for newspapers, was violated in the cases of both the Tupac story and the Tribune’s stealth video. The only difference between the two cases is that the Los Angeles Times was the victim and the Chicago Tribune was the perpetrator. And, for the record, I am not old. Although I recently turned 59, most people say I don’t look a day over 58½. 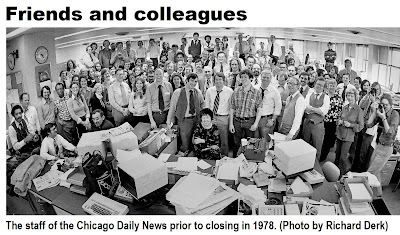 Two events in the colorful annals of Chicago journalism will give you a sense of how undercover enterprise projects have evolved in the last 30 years. Sadly, it hasn’t been for the better. The first event occurred in 1977, when the Chicago Sun-Times surreptitiously purchased a tavern riddled with building-code violations, so it could document how many city inspectors and fire marshals could be bought off with a stack of $10 bills. While both projects required exceptional stealth on the part of each newspaper, that’s where the similarity stops. The tavern investigation, which resulted in the sanction or conviction of several inspectors, as well as promises of improved integrity on the part of city officials, served a clear public interest. The Tribune video, though cleverly executed, was nothing more than a stunt designed to embarrass the Sun-Times. The investigation at the tavern whimsically called the Mirage was denied a Pulitzer Prize by jurors who believed the Sun-Times had engaged in unethical deception to get the story. The editors of the newspaper, which I joined shortly after the series was published, argued that the story simply couldn’t be obtained without resorting to an elaborate undercover investigation. By contrast, the Tribune video, which is unlikely to be considered for the Pulitzer or any other award, resulted from deception for the sake of deception. Before the Sun-Times awarded the prize in the video contest, its reporter called the Tribune intern posing as the creator of the winning video. The Trib intern, who took the call from the Sun-Times while sitting in a conference room at the Tribune, stated that she was a graduate student at the University of Illinois, which is true. But she left out the part about being an intern at the Tribune. And being dragged along to the taping of the video after it was conceived and scripted by a group of her colleagues, including the paper’s multimedia staff. “I didn't really know what was going on until we were in the car, driving to Wrigley," said Katie Hamilton in an interview with P.J. Hufstetter of the Los Angeles Times. As a clutch of Tribune staffers listened to Katie shining on the Sun-Times reporter, Tribune features editor Tim Bannon said he felt a twinge of unease about not telling Katie to confess that she works for the Tribune, according to the L.A. Times. In fact, the Tribune didn’t come clean until after the Sun-Times published a page one story proclaiming Katie the winner of the video contest. 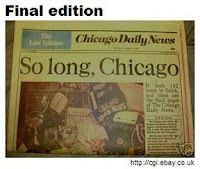 So, this enterprising journalist not only deceived the Sun-Times and, by extension, the public. He apparently has succeeded in deceiving himself, too. "Alan Mutter's self-description as a 'Newsosaur' seems right on the mark, an antiquated, Ben Hechtian view of how newsrooms should operate," responds Kevin Pang, the creator of the Tribune video. "The idea that everything we do should have a FOIA request attached is journalism elitism at its most pretentious." His full post is at Poynter Online. The continuing meltdown of newspaper stocks and bond ratings has provoked emails and calls from readers seeking a deeper understanding of the financial pressures facing publishers. This is the second of two posts (the first is here) answering the most common questions. Q. 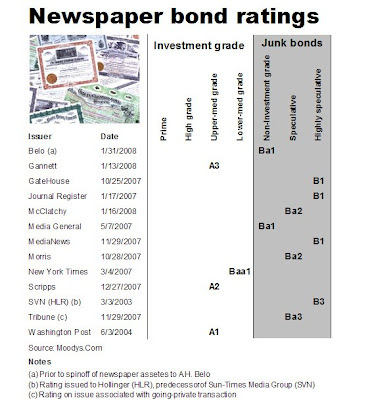 The ratings on newspaper bonds keep falling. What are bonds, anyway? And why are ratings dropping? A. Companies needing to borrow money to finance acquisitions, expansions and other normal business activities sell bonds, which are elaborate IOUs promising to pay lenders a certain rate of interest at prescribed intervals and to repay the loan in a defined period of time. When a company issues bonds that will be bought and sold in the public market – as most are – they hire a private, for-profit rating agency to examine their finances and business prospects to independently assess the issuer’s ability to repay the obligation in accordance with the terms of the bond. In addition to rating a bond before it initially is sold, the agencies continue to monitor an issue through its lifetime and adjust the credit’s rating according to the company’s performance. The major rating agencies are Standard and Poor’s, Moody’s Investor Services and Fitch Ratings. They rate the risk, and therefore the quality, of the bond on a scale that usually ranges from triple-A, for the most secure bond, to something starting with a “C” for the riskiest issues. Each agency uses a slightly different rating system but there’s a handy cheat sheet here. A security rated at Ba or lower by Moody’s or BB or lower by S&P is considered to be a junk bond, which means that the likelihood of timely repayment is too uncertain to permit the security to be held as an investment in the portfolios of most pension funds, insurance companies and other institutional accounts. As you can see from the table below (which you can click to enlarge), the bonds of two out of three newspaper companies tracked by Moody’s are in junk territory. Q. The bond rating of Journal Register Co. last week fell by two notches to B-minus from B-plus. What does that mean? A. The downgrade of a credit rating signals that the independent agencies are worried a company will not have sufficient sales or profits to fulfill its future obligations to repay or reduce its debt. A rapid series of downgrades indicates a heightened concern that those obligations may not be met. The bond ratings of most newspapers have dropped in the last three years , because a number of publishers unfortunately loaded up on substantial amounts of debt just as the industry was entering a dramatic and unprecedented decline. Beyond JRC, the publishers whose credit ratings have fallen – in some cases multiple times – include Belo, GateHouse Media, McClatchy, Media General, MediaNews Group, Morris and Tribune. Others, like New York Times Co., have been put on a watch, meaning they are at risk of having their ratings dropped if their operating performance deteriorates. Some publishers, like GateHouse, MediaNews and McClatchy, took on substantial debt to finance the acquisitions of additional newspapers. Other publishers, including Tribune Co., the Minneapolis Star Tribune and Philadelphia Newspapers, borrowed money to buy out other shareholders to become private businesses. Q. Why does it matter if a credit rating drops? The Tribune Co., which has been put on warning of a possible rating downgrade by S&P, would face an additional $20.5 million in interest payments it were forced as the result of a downgrade to pay 0.25% a year in additional interest on its $8.2 billion in debt. The additional $20.5 million in interest would be equal to a sixth of the newsroom budget of the Los Angeles Times. If a company's credit ratings fell low enough, it could be shut out of the credit market altogether. This is of particular concern in a period when credit markets have constricted, as they have since mid-summer. And the Bear Stearns meltdown isn't going to improve the situation for any borrower. Q. Is the newspaper industry that bad off or have the rating agencies just gotten stricter? A. Both. While the newspaper industry undeniably is suffering from declines in readership, sales and profits, the recalibration of newspaper credit ratings is to some degree the result of heightened vigilance on the part of the rating agencies. Having essentially failed to recognize the shaky financings responsible, in part, for the sub-prime mortgage mess, the agencies now have taken to aggressively re-rating issues in all industries so they aren’t accused of missing any future problems. Q. What happens if a publisher can’t make its interest payment or fulfill other key bond provisions? A. There is nothing wrong with borrowing money to finance business requirements, so long as a company has a plan to increase sales and profits to satisfy its debt. But there’s a big problem when a business can’t do so. A company is said to be in default when it cannot repay its debt on a timely basis or when it fails to comply with other key terms of its loan. In the case of several of the publishers whose debt has been downgraded, one of the major requirements of their bonds is that they reduce over time the ratio of their debt to their operating profits. While a company might have started out borrowing money at 7.5 times its operating profit, for example, it could be required a year later to have increased its profits (or repaid some debt) to the point that the debt was equal to only 7.25x profits. If the company is profitable but just not profitable enough to satisfy the prescribed ratio, it is in violation of the terms of the loan. Depending on their severity and duration, breaches of a loan's provisions (typically called "covenants") can trigger a variety of consequences, ranging from higher interest rates to the forced sale of assets to, in the most extreme cases, the takeover of the company by its lenders. The best way to assure compliance with convenants requiring specified levels of profitability is to increase sales without raising expenses. If sales don’t rise fast enough to meet the prescribed targets – or worse, fall – then the only alternative is for management to cut expenses. That’s why the highly leveraged publishers mentioned here have been reducing newsprint consumption, trimming headcount, outsourcing ad production and cutting every conceivable expense for the last few years. While expense reductions can help a company comply with its debt covenants for a period of time, cost cutting is not a long-term strategy for success, because a newspaper can’t replicate annually the one-time benefit of eliminating its stock listings, closing a remote bureau or eliminating dental insurance. Q. What would happen if a newspaper defaulted on its debt? A. A default occurs when a borrower does not have the ability to repay a bond or to meet certain major covenants of the credit. Fortunately, lenders don’t want to be responsible for operating a struggling newspaper any more than banks want to own portfolios of abandoned, foreclosed homes. So, the first effort in the event of a default would be to give the publisher some extra time to solve the problem – perhaps with the lender-mandated assistance of executives who specialize in cutting costs and otherwise restructuring troubled businesses. In that event, newspapers likely would undergo more vigorous cost cutting than anything seen to date. If workout experts couldn’t find a way to improve the sales and profitability of a property, then it likely would be offered for sale (subject to the risks, challenges and investor skepticism discussed earlier here) in what for the foreseeable future would seem to be a less than hospitable market. If a buyer couldn’t be found in a reasonable period of time, the business would be closed and its physical assets – from cubicles to vehicles – would be auctioned to the highest bidder. The continuing meltdown of newspaper stocks and bond ratings has provoked emails and calls from readers seeking a deeper understanding of the financial pressures facing publishers. In the first of two posts (second is here), these are answers to the most common questions. Q. Trading of Journal Register Co. (JRC, which closed Friday at $0.79) and the Sun-Times Media Group (SVN, $0.82) has been halted at the New York Stock Exchange because the price of their shares is below the minimum required by the exchange. What does this mean? What happens to the companies? A. A stock is not permitted to trade on the floor of the Big Board if it falls below $1.05 a share, a threshold that both JRC and SVN crossed last month. This was a big deal in the days that all buy and sell orders were matched by human beings on the trading floor of the NYSE, but it doesn’t matter as much today, because the shares continue to trade on several computerized systems that do the same thing. Although the NYSE has halted floor trading for JRC and SVN, anyone can buy and sell these shares through any broker. Stock quotes are available at MarketWatch, Yahoo Finance and all the usual places. Floor trading in a stock can resume at the Big Board if it trades above $1.10 a share for a full day, but a stumble below $1.05 for even a minute will put the issue back in the penalty box. Disclosures: I own shares of JRC that I bought for well over $1 and have worked as a consultant for SVN. Q. Do deteriorating stock prices mean a company is headed for bankruptcy? A. No. A company’s stock price is an indicator of the collective investor sentiment about the future value of a business, which nowadays is influenced by the plummet of newspaper revenues and circulation over the last three-plus years. But a company is not bankrupt unless its liabilities outweigh its assets. A low share price is not necessarily a precursor of bankruptcy. Regardless of its stock price, a company can continue to operate as long as it takes in more money than it spends. It even can weather losses for a period of time, if it has adequate cash reserves to continue paying its bills during the period it is not making a profit. But no business can remain a going concern forever, if rising costs and/or falling revenues prevent it from making a profit. To be clear: Most newspapers continue to make healthy profits, as compared with many other industries. But investors, as discussed more fully below, are distressed that the profits of most publishers are not as high, or as predictable, as they used to be. 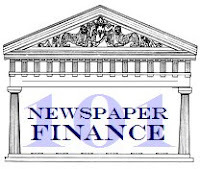 Further, as discussed more fully in the next installment of this series, many newspapers have borrowed substantial sums of money that require them to not only sustain, but increase, their profit margins in a challenging time of industry contraction. Q. Will SVN or JRC be acquired by strategic buyers with properties nearby? A. SVN earlier this year retained an investment banker to explore the sale of the company, which is a collection of five operating groups that collectively publish more than 80 titles in Chicago and its suburbs. The process of potentially selling some or all of the assets was under way before the price of its stock dropped below $1.05. Individually or as a whole, SVN’s assets could be of interest to community-newspaper publishers like GateHouse and/or wealthy local citizens who want to ensure the ongoing publication of the flagship Chicago Sun-Times, the No. 2 daily in the metropolitan area behind the Chicago Tribune. Some people have speculated that the Sun-Times might wind up being acquired by, or entering into a partnership with, the Tribune. In a cost-saving move, Tribune trucks already have taken over delivery of the Sun-Times. JRC operates newspapers in six clusters. It would be possible to break up the company by selling some or all of the assets to neighboring publishers, who could add the titles to their existing operations while saving the costs of independent advertising staffs, production facilities and so forth. As but one example, JRC’s largest cluster, which surrounds Philadelphia, could be of interest to Gannett, Advance Publications or the local investor group that owns the Philadelphia Inquirer and Daily News. The liquidation of JRC likely would come at quite a loss. The company paid $415 million in 2004 for a cluster of daily and weekly papers in Michigan, where the sagging economy has depressed the sales and profitability of the properties. If JRC could find a buyer willing to purchase a cluster of troubled newspapers serving several struggling Detroit communities, it is difficult to imagine how the papers would be even worth half of what the company paid for them less than four years ago. Q. Given the negative investor sentiment regarding the industry, who would want to buy a newspaper-publishing company? MNI is not alone in being required by accounting rules to write down the value of its acquisition. Others forced to take similar steps include the New York Times Co., Belo and GateHouse, another ambitiously acquisitive publishing company whose shares have fallen nearly 72% to $6.26 since its initial public offering in November, 2006. Disclosure: I own shares of MNI, which I bought at considerably more than $8.95 apiece. Q. Why are investors so down on newspapers, anyway? First, newspaper sales and profits, which had been wondrously predictable from year to year as recently as 2000, are anything but today. The only thing investors abhor more than uncertainty is a steady procession of quarterly declines in sales and profits with no discernible end in sight. And that’s what they have been seeing since the beginning of 2005. Second, the financial community has become increasingly skeptical about the ability of newspaper managers to adapt their business models fast enough to the technological, demographic and economic forces that have battered the industry since the start of 2005. Third, there is far less money to invest and lend in the current, credit-constrained economy. Last but not least, most investors and lenders are not convinced – even with some stocks trading at well under $1 share – that newspaper values have hit bottom. Except for a few well-heeled contrarians like Rupert Murdoch, Sam Zell and the activists who have purchased respectively 19% of NYT and 21% of Media General, most investors will steer clear of newspapers until they see a sustained rebound in public stock prices and the value of newspapers in private merger transactions. The fact that a few hardy investors are zeroing on newspapers suggests that they think a bottom could be near. Q. 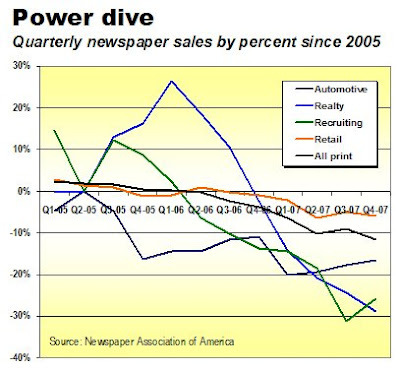 When will newspaper values recover? A. That’s the $64,000 question. The short answer is that newspaper values will recover when publishers show they once again are capable of producing consistent and predictable gains in sales and profits. This will require (i) the creativity, skill and discipline to undertake a rapid, top-to-bottom overhaul of an outmoded and broken business model, (ii) an improvement in the overall economy and (iii) a heaping helping of luck. If the Ochs-Sulzberger clan wants to shield the New York Times from the pressure mounting from increasingly restive investors, the family needs to consider more urgently than ever the idea of taking the company private. Unfortunately, the double-whammy deterioration of the financial markets and the company’s performance over the last year would force the sale of even more of NYT Co.’s assets today than might have been the case if the family had decided before now to silence its critics by purchasing the shares now owned by public investors. Even though the family has decisive control over NYT Co. as the result of a two-tier stock structure that gives it twice the voting power of all the public shareholders put together, the company has been under sustained assault for more than a year by activist investors who believe the business is being poorly managed. Chief among the investor complaints is that the company’s stock has declined by 54% since the end of 2004, closing Friday at $18.69 per share. Making matters worse, nearly a third of the $3.1 billion in market value lost since 2005 has vaporzied in the last 12 months. While disgruntled investors can’t engineer a sale or takeover of NYT as long as the family hangs together (something that proved to be beyond the Bancrofts when Rupert Murdoch zeroed in on Dow Jones), the continued public flogging by aggrieved shareholders is not only demoralizing to the NYT’s besieged management but also a major distraction for a company trying to defend the nation’s newspaper of record against the myriad challenges assailing the industry. The management and board of NYT Co. barely survived a symbolic vote of no confidence at the annual meeting in April, 2007, when 42% of the investors holding common shares voted against the directors nominated by the family for the four seats on the 13-person board allotted to public shareholders. The family controls the other nine board seats, giving it ultimate authority. But that has not stopped activist shareholders from raising a ruckus. The new investors are Firebrand, a small New York-based investment strategy firm, and the $20 billion Harbinger hedge fund. To prove they aren’t messing around, the investors have paid exactly $487,122,157.68 over the last year to acquire 19% of NYT’s shares, according to a filing Friday with the Securities and Exchange Commission. Now, Firebrand-Harbinger are seeking to put four of their own directors in the seats representing common shareholders on the NYT board – a proposal that to date has been spurned by the company’s management. Undeterred, the activists have responded by commencing a proxy battle in hopes of gaining control of the disputed seats. Unless something gives between now and the annual meeting on April 22, it is quite conceivable, based on last year’s close vote, that a majority of the common shareholders could line up behind the Firebrand-Harbinger slate to install some or all of its four nominees on the NYT board. How big of a difference could four directors make on a 13-person board? Well, a year after becoming directors at Gateway, two of the very same individuals vying for NYT board helped steer the struggling computer manufacturer to a merger with a competitor, Acer. Sources familiar with the thinking of the Firebrand-Harbinger group have indicated (details in this post) that the activists aren’t interested in pushing for the breakup of NYT Co. in the ways that disgruntled investors forced the liquidation of Knight Ridder and the eventual leveraged buyout of the Tribune Co. But the appearance of a covey of inquiring, if not to say querulous, directors is bound to lead to many more spirited discussions than usual at future NYT board meetings. So, what would you do if you were a wealthy and powerful publishing scion like Arthur Ochs Sulzberger Jr.? Put up with it? Or, buy the outstanding common shares of the company so you could take the business private and run it as you and your family see fit? The problem, as noted at the outset of this article, is that the credit crunch since the subprime debacle this summer has made the market for a going-private transaction far less hospitable today than it was a year ago. The good news, if you want to call it that, is that the value of the NYT Co. has declined so much in the last year (nearly 25%) that it would cost less to buy the company today than it would have 12 months ago. But the deal still wouldn't be cheap. As you can see from the table below, the total market value of the shares owned by public investors in NYT has fallen by 24.7% in the last year to $2.68 billion as of Feb. 29, 2008, vs. $3.56 billion on Feb. 28, 2007. If the family wanted to take the company private by buying all the outstanding common shares for 20% more than their current value (the minimum acceptable premium in such a transaction), it would have to pay $3.2 billion to take the company private while assuming the $1 billion in debt the company already owes. To finance the transaction, the family would need to quadruple the $1 billion in debt on the company’s books to $4.2 billion. Although the family might have been able to borrow $3 billion prior to the time the credit markets seized up, it is unlikely that lenders would allow the family to borrow more than $2 billion under the tighter lending standards in effect today. The only way to swing a $4.2 billion deal when when bankers will lend only $2 billion is for the family to raise additional cash by selling such assets as NYT's real estate and non-core publishing properties. Unfortunately, the dismal condition of the newspaper business has reduced the value of NYT’s publishing holdings over the last year. Owing to tumbling sales and profits, I have dropped my estimate of the value of the Boston Globe and the associated New England properties to $450 million today from $650 million in the spring of 2007. Because the NYT's newspapers in Florida and California are at the two epicenters of the real estate slump, I have reduced my estimated value of the regional group to $675 million this year from $900 million a year ago. The third publishing asset apart from the Times itself is the International Herald Tribune, whose unique cachet and market position might attract a buyer willing to pay the same $150 million this year that I estimated it was worth in 2007. 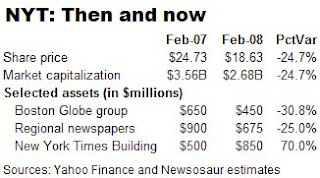 Assuming the estimates are correct, the sale of the above publishing assets would realize less than $1.3 billion of the $2 billion likely to be required to take NYT private. Unless the family wanted to take the unlikely step of selling About.Com, its principal new media asset, the only remaining jewel of significance would be the office building that opened last fall. Based on the value of a financing transaction undertaken by NYT’s partner in the project, I would estimate the publisher’s share of the building to be about $850 million. The sale of some or all of the NYT’s interest in the building, plus the sale of the non-core publishing assets, would make it possible for the family to take NYT private, thus insulating America’s leading journalistic institution from the scrutiny and second-guessing of external investors. The only challenges after that would be to profitably manage the down-sized company – and keeping all the family members happy about havng a substantial portion of their wealth committed to the ongoing stewardship of the New York Times. Some of the coolest, most enterprising and evidently best-executed innovations in the newspaper industry are coming from small papers that don’t seem to be owned by one of the big chains. Happenstance? I don’t think so. Unencumbered and undistracted by the bureaucracy that mires the major publishing companies in expensive infrastructure and costly indecision, the editors, publishers and ad sales staffs at some small- and medium-sized newspapers appear to be making good use of the time they don’t spend talking with Corporate. Instead, they are talking with advertisers, readers and non-readers to discover the products they can build to satisfy them. Then, they are building them. That’s the picture that emerges in the latest report from the Newspaper Next project at the American Press Institute. The free download of the report weighs in at 108 bandwidth-busting pages, but you can save time by skipping the self-evident 21-page preamble and going directly to the two-dozen case studies of newspapers that have boldy taken initiatives out of the conference room and into the marketplace. :: Monroetalks.com, a hyper-local website that’s actually filled with pertinent and valuable user-generated content, was created by the Monroe (MI) Evening News, an employee-owned paper with 20k circulation. The site includes active message boards, a rich and thorough calendar of community activities, a varied and deep selection of user-supplied photos (including a cherry-red 1954 Chevy Bel Air convertible) and a nifty feature on the front of the site called Top Talkers, which cleverly encourages further participation by identifying the people contributing most actively to the site. :: The Beachcomber, a free, 3k-circulation Tuesday-Saturday paper is published from June through Labor Day by the Portsmouth (NH) Herald, a 12k Ottaway paper. “A hyperlocal daily focused on things to do at the beach” in the seasonal recreational community, the paper is dropped in bulk at the tourist-oriented businesses who pay “shockingly low” rates to advertise in it, according to the N2 report. But it still made a 28% profit margin. :: DeliveringQC.Com, a site operated by the 43k-circ Moline (IL) Dispatch, is a win-win-win for readers, advertisers and the newspaper. Here’s how it works: The newspaper barters gift certificates from merchants in exchange for advertising in the paper. The paper sells the gift certificates to its subscrbers at about 50% of their face value. When subscribers redeem the certificates at participating businesses, they often spend more than the value of the certificate. “We have offered the platform to other newspapers at very little cost, but most of them don’t get it,” publisher John Newby told N2. 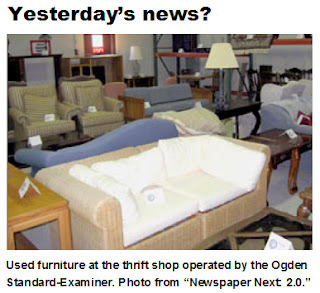 The weirdest project – because it departs so far from the traditional mission of publishers – is the thrift shop opened by the 62k-circ Ogden (UT) Standard-Examiner. Merchandise and customers are attracted by ads in the newspaper's various local media and the paper makes its money by collecting 25% of the value of the junk it sells. Lessons learned include (a) not stocking used mattresses and (b) not asking newspaper delivery drivers to haul furniture. While innovating new web and print products involves a certain amount of intellectual heavy lifting, the evident success of these local publishing entrepreneurs proves that small, nimble and empowered teams can run circles around the bigger and better-funded entities that are more focused on process and posterior-covering than on good, fast and cheap results. Rapid, low-friction development is how we got Google, You Tube, Craig’s List, Yelp, Outside.In and the hundreds of other competitors who are eating the breakfast, lunch, dinner and in-between-meal snacks of the newspaper industry. Newspapers intending to survive in the interactive age have to learn to compete in the same way their competitors do. One way newspapers can be more efficient is by entering into partnerships with the exploding number of young technology firms who would give almost anything to access the brand, audience and advertisers that newspapers seemingly take for granted. If newspaper companies don't start competing effectively soon, more of their shares could wind up like those of Journal Register and the Sun-Times Media Group, which last week both closed below the minumum $1.05 apiece required to trade on the New York Stock Exchange. Where do you go from there? The bargain bin at Ogden’s thrift shop?